archives/learninggame.shtml Learning Games from Education World. Check out such reinforcement games as Unanimouse Spelling, Read the Teacher's Mind, or Find it Fast! * Mueller, Pamela, Lifers: Learning from At-Risk Adolescent Readers (2001) Heinemann. This a powerful book about the experiences of struggling high-school readers gives insight into the amazing power of layered instruction. * Sprenger, Marille, How to Teach So Students Remember (2005) Association for Supervision and Curriculum Development. Chapters 4, 5, and 6 concentrate on layering instruction. * Nunley, Dr. Kathie, Layered Instruction (2001) Brains.org. This book provides a different viewpoint based on current brain-imaging information and outlining a student-centered teaching method in three tiers. Is student learning limited to core instructional time? How do you support students that need more to "get it"? How can you turn "dead zones" into reinforcement? Don't forget to add your comments to our Reading Message Board. The pace of instruction seems our first enemy. We all can identify students for whom the curriculum moves too fast. They can't seem to master skills before we move to a new concept. These students often keep schools from making adequate yearly progress or, at best, leave frustrated teachers saying "they met the minimum standard; we have to move on." All that makes it imperative that we create multiple opportunities to enforce what we most want children to learn. How do we do that? Use small groups to review explicitly, while others work independently. Even if you can afford only 15 minutes at a time, that's 15 minutes of review they wouldn't have had. Target one skill (identifying nouns, for example) and approach it from a different perspective. Spread out single word flashcards and let children choose the words they know are nouns and identify them. Discuss the remaining words as different parts of speech, or review the "person, place or thing" definition as you name others. Our first Reading Coach column, The Use of Multiple Grouping to Improve Student Achievement, gives more tips for working with small groups. Master moving efficiently from one task to another, and teach your students to do the same. Anytime students wait in line, share from a quick read bag such books as Ripley's Believe It or Not for middle school students, Jon Scieszka's Time Warp Trio series for 7-12 year olds, and small books like Larkin's Little Readers for K-1. Have students explore/read whenever the line stops. Keeping a line busy is easier than "shushing" and you add another layer. 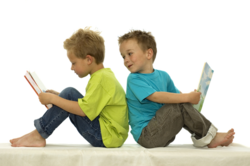 Choose fun-to-read books they can pick up again at free reading time. Do you have a question about teaching reading? Click here to send an e-mail to Cathy Puett Miller . Use coming-together and waiting time to reward students. Let K-12 students play computer learning games, such as The Grammar Gorillas or Where is That? (available free at Funbrain.com) to reinforce knowledge. Play such quick ticket-out-the-door games as Spell a Capital: children must give a short answer to a question before they exit to specials, the library, or home. Reach outside class for more layering. Use opportunities when you meet parents to suggest quick targeted at-home activities that meet specific needs of their child. List them in your newsletter. Offer choices of at-home activities that relate to key grade-level reading standards. Let families pick a short, fun activity that works for them, and change activities once a semester. For example, second grade students might give their parents a spelling test on the week's words (takes all of five minutes). Students then grade the tests based on their own knowledge. Any words they are unsure of? Families can check the study guide together. Utilize community resources. Is a volunteer tutoring program nearby? Ask the program to add phonics games, comprehension strategies, or literature reviews to its lessons, so every minute of the tutoring session targets skills you teach. In the model I designed for a volunteer-based tutoring program (See RIFE), sight word play happens for five minutes of each session, building quick, automatic recognition of key words. Pull 3 vocabulary words a day from a book read in class. Put the words on a WOW (Working On Words) board and encourage students to use the words as much as possible. My students do WOW stories. Anytime we have a few extra minutes, I have them tell me a sentence using as many of their vocabulary words as possible. That lets me know they remember the words and know how to use them.